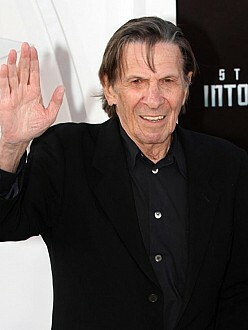 The 83-year-old actor, who is best known for playing the character Spock in the Star Trek TV series and films for more 40 years, passed away at his home in Bel Air, Los Angeles on Friday and his funeral took place yesterday. The actor – who died of end-stage chronic obstructive pulmonary disease – was laid to rest during a traditional Jewish ceremony in a private service attended by just close friends and family, including wife Susan, children Adam and Julie and his stepson Aaron Bay Schuck. The service took place close to Leonard’s home, but his representative refused to confirm reports it was held at the Hillside Memorial Park and Mortuary. In an attempt to make amends, the 83-year-old actor – whose daughters Melanie and Lisabeth attended the funeral – staged a Twitter Q and A about his memories of his pal yesterday instead. Fan Expo: Day Four Roundup with Mark Hamill and George Takei!